Disadvantages of jQuery unobtrusive validation in MVC. There are some disadvantages of using this plugin. When using the jQuery unobtrusive validation plugin, it creates a span tag to display error messages. 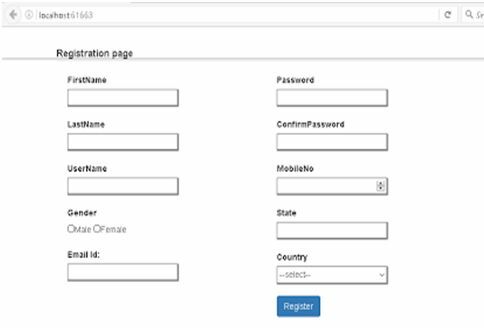 If you have, for example, a horizontal form on top of the other controls, then this behavior might not be working for you, since they will break the page layout. It was the case for me and as such, I decided to change the default behavior of the jQuery unobtrusive validation library and instead of using a span to show the error message, I decided to use a tooltip. 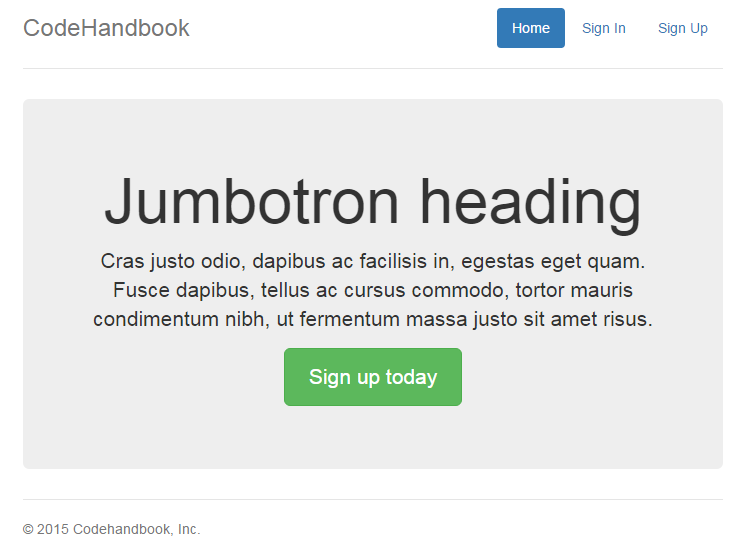 I am going to show you how I achieved this, using a tooltip with the help of a bootstrap. Before going to the tooltip validation, first look at the traditional jQuery unobtrusive example. The following is an example of an application of unobtrusive validation. If I increase the length of the error message, the layout will be broken like this. In the same way, when I place the same length error message below, the Textbox controls come as shown in the screenshot. The same layout-change problem occurs. Hence, this is a bad idea of using a default behavior of the jQuery Unobtrusive validation plugin. I replaced the error type with a tooltip. It won’t change the layout structure. 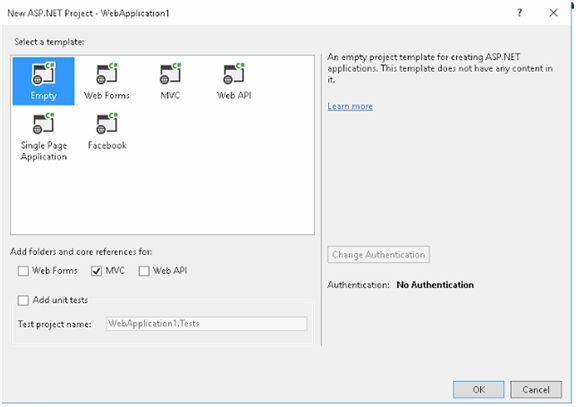 Create Application with MVC template. 2. Add the following files. Right click->Controllers folder->Add->Controller->name it as HomeController.cs. 4. Add Index Method to the Controller. 5. Add View to Index Action method. Right click->Index Method->Add View->click OK.
Add myscript.js to the script folder. maxlength:"only 15 chars are allowed"
maxlength: "only 15 chars are allowed"
minlength:"pls enter min 5 chars"
minlength: "pls enter valid mobile no"
//tooltip options to change position of tooltip..
No errors. Like a boss. There be ' + validator.numberOfInvalids() + ' error' + (validator.numberOfInvalids() &gt; 1 ? 's' : '') + ' here. OH NOES!!!!! Add styles for the error display. 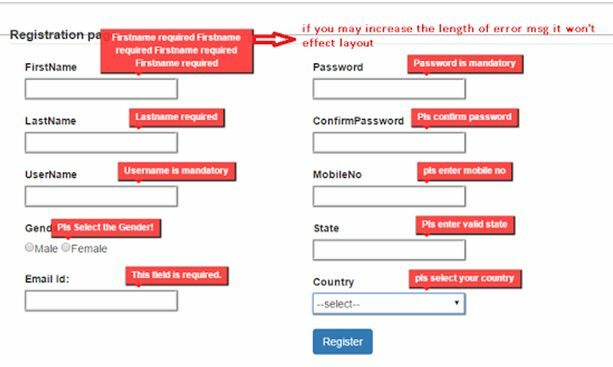 Without entering anything into the fields, just click on the Register button and see what happens. 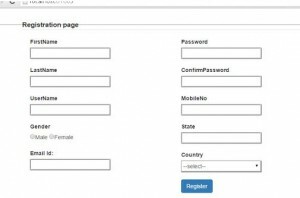 How To Creating a Web App Using ASP.NET MVC 4 and AngularJS ? Now there are a couple of things in the above HTML code that would be confusing to a beginner. Let’s take them one by one. Why do we need to use bundle ? Why not include the files directly like we do in web forms ? Next thing that may look odd in the above code is the @RenderBody(). This is the section of the layout page where the content is rendered each time a new request is received. Ok now we are all set with the layout code for our web application. Now let’s add a controller inside the Controllers folder called LoginController. Inside the LoginController define a method called ShowDefault which would render a default view. Set the default controller and action method to be called when the app start in the RouteConfig.cs file. Save the changes and try running the application and you should be able to see the asp.net MVC 4 app in action. 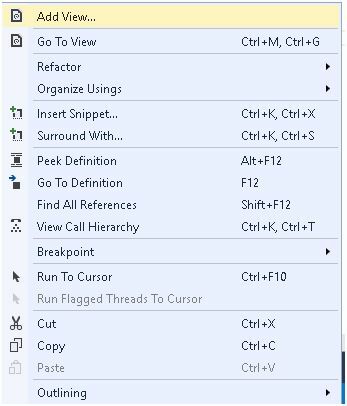 To include AngularJS in your ASP.NET MVC web app, download the AngularJS file and place it in the Scripts folder in your web app. Inside the BundleConfig.cs file include the angular js file too. Add one more file called app.js in the Scripts folder which would be the root file of our AngularJS application. Include the app.js file as reference in the _Layout.cshtml page. Inside the _Layout.cshtml file add the ngApp directive to the HTML tag. And that’s it, AngularJS has been successfully added to the MVC web app and ready to use. 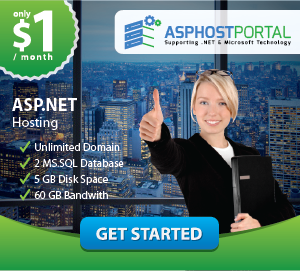 CheapASPNETHostingReview.com | Best and cheap ASP.NET MVC hosting. 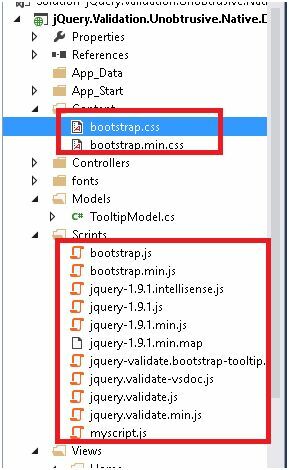 In this tutorial I will show you about bootstrap in ASP.NET MVC. I use Bootstrap in almost every project I build these days. I build up a custom Bootstrap configuration to reduce bloat, and have my workflow down-pat for updating those configurations (which I’ll write about in the near future). I have familiarised myself with it’s ins-and-outs to help ensure I use it to it’s full potential without being overkill, and it has sped up my HTML build time immensely.